When the Baw Baw Council was forced in 2008 by local government regulations to publish its animal management data in their Domestic Animal Management Plan*, the details were grim. That is, practically all cats were killed. While nearly three times as many unclaimed dogs were killed, than rehomed. So by the time the next Domestic Animal Management Plan was required to be published four years later, Council had a plan. Baw Baw’s euthanasia figures to date for 2013/14 have dropped due to utilising an adoption agency to re-house most dogs and cats. Genius. Just get unpaid, volunteer community rescue groups to do your job for you! And no one can argue, if you're a dog, you're much better off now than in 2007. (But not so much if you're a cat. If you're a cat, you're still probably screwed). 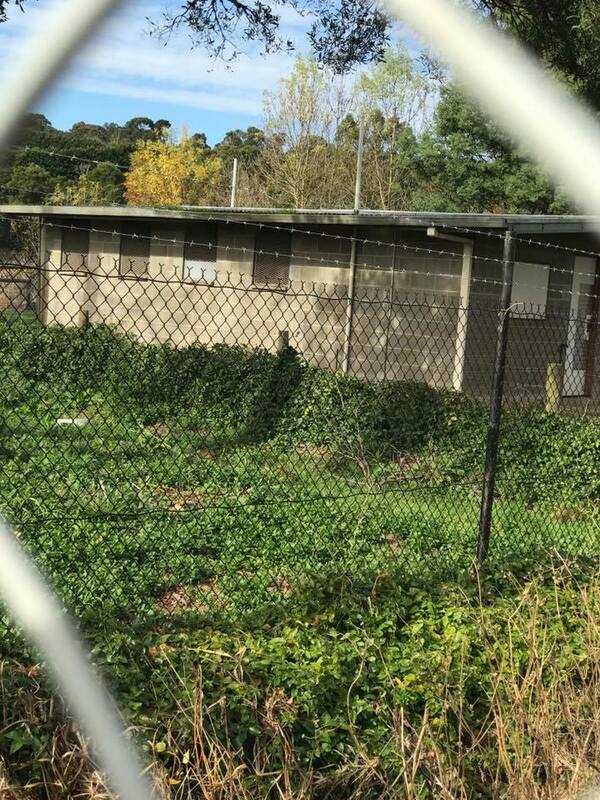 Baw Baw Shire’s ageing pound facility, built in 1991 by the Shire of Warragul, lacked isolation facilities and had un-sterilisable flooring which no longer met government regulations for health or welfare for animals. 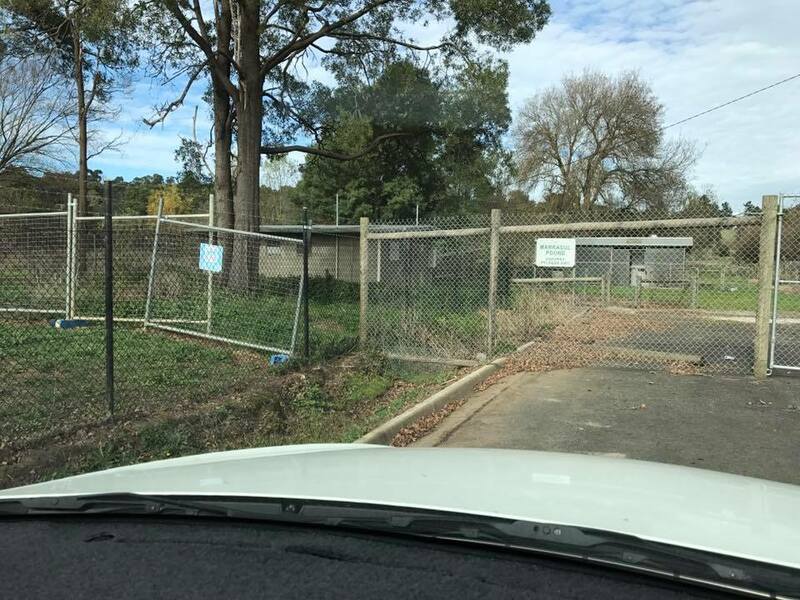 Since the pound no longer met the Victorian Government’s Code of Practice for the Operation of Shelters and Pounds, Baw Baw Shire was forced to seek a new animal pound location. In January 2016, Council conducted a thorough community consultation campaign over a four week period to discuss potential options for the proposed new animal pound. Council identified three potential sites that addressed the necessary compliance requirements and invited the community to provide alternative site suggestions. During this process Council received valuable feedback, which helped inform Council’s decision making. Baw Baw Shire Council has purchased Utopia Pet Lodge, a 2.023 hectare first class pet boarding facility located in Longwarry. The purchase price for the business, land and improvements totalled $1.2 million. Settlement is set for 31 August 2016. That sounds so great! A council who listens to the community when it says it wants needy pets cared for and treated humanely, and then spends a massive $1.2 million dollars in securing an actual animal shelter that serves and caters to the emotional needs and health of animals, to use for their local pound. 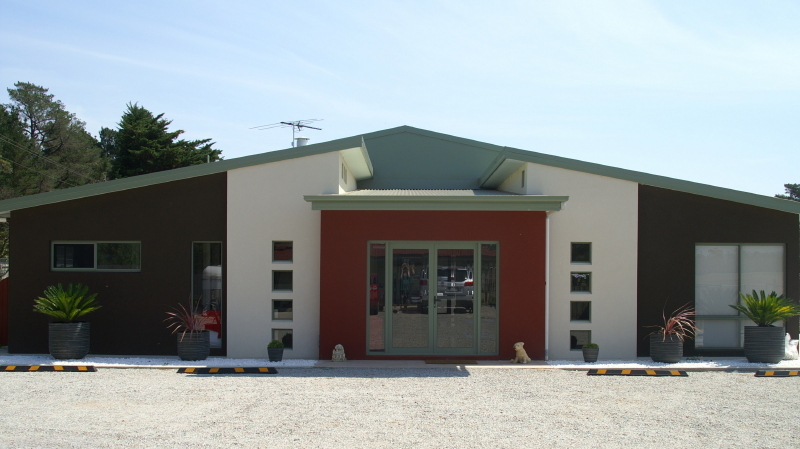 "Utopia Pet Lodge is Gippslands own boutique luxury pet care facility." Council will own the business name and continue to operate the business as Utopia Pet Lodge. Initially Council will directly manage the facility and will continue to investigate the most appropriate management structure for the successful operation of the business. Income received from the business will provide a welcome additional revenue stream to Council. Um - ok. But it's going to be a great new pound, right? Mayor of Baw Baw Shire Councillor Joe Gauci said this strategic investment provides Council with an innovative approach to co-locate a completely separate animal pound on the property. 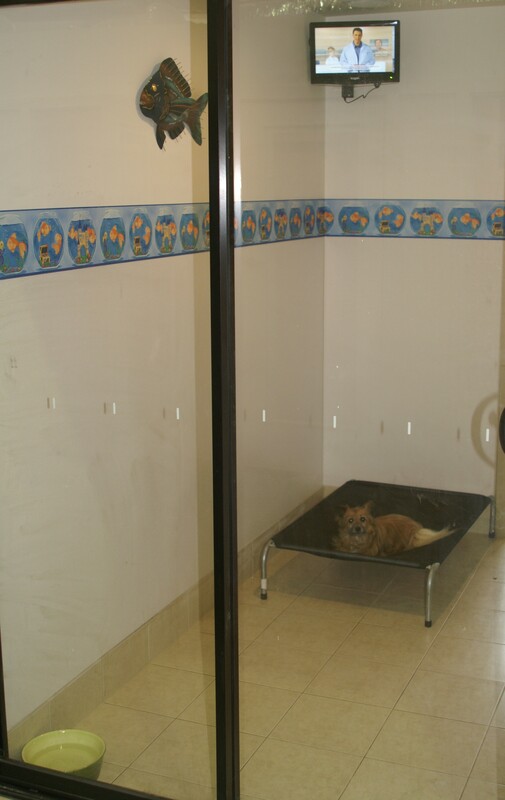 Council’s pound operation and the impounded animals in its care will be situated in separate locations on site to that of the pet accommodation facilities. Council is excited by the commercial scope available through this purchase, allowing us to offer additional pet services and luxury accommodation, whilst also offsetting our costs. The commercial scope? Da faq? Buying a $1.2 million dollar facility, and then tacking on an extra kennel block, isn't "innovative animal management" - that's "you bought a for-profit, boarding kennel with the community's pound money". How in dogs name has this been allowed to happen? And what of the 300 or so pound pets that have been impounded since September 2016 - when Utopia was taken over by Baw Baw Council - where have they been being sent? Well, ten months on they're still going to the shitbox, non-compliant, horror pound. I would like to express my absolute disgust with the facility that you keep dogs in when they end up in your pound. 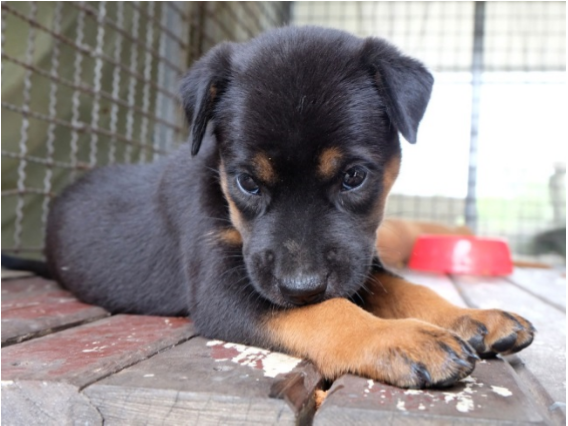 My son who was visiting me in Drouin from the country… received the call that his dog had been picked up and was in the pound… (we followed) an employee to the pound to turn up to what I describe as a living hell. I’ve have never seen such a disgusting building holding live animals, no windows, no ventilation, no human contact except once a day when they are fed apparently, the smell was overwhelming. I wouldn’t want another dog to spend one day in that filth, they can’t see out anywhere, they leap continually to try and see any form of life through the wire at the top of steel doors, no blankets, no stimulation of any form, it was by far the worst facility holding dogs that I have ever seen. You should be ashamed of that lesser block building… disgusting shire of Baw Baw you should be ashamed." But residents should actually be asking, why did council spend $1.2 million dollars on a new facility, if processes at the existing pound are "excellent" and the only problems with the old pound were purely cosmetic? However, if the new pound was purchased to replace the old pound, what could possibly be the near year-long delay in starting to use the facility for the purposes of protecting strays and homeless pets? Why is there any "decision" still to be made about the future of the community's homeless pets, after such a massive community investment has already been made? ... while at the same time treating the community's lost pets - the ones they're entrusted to care for - for like inconvenient, disposable rubbish. 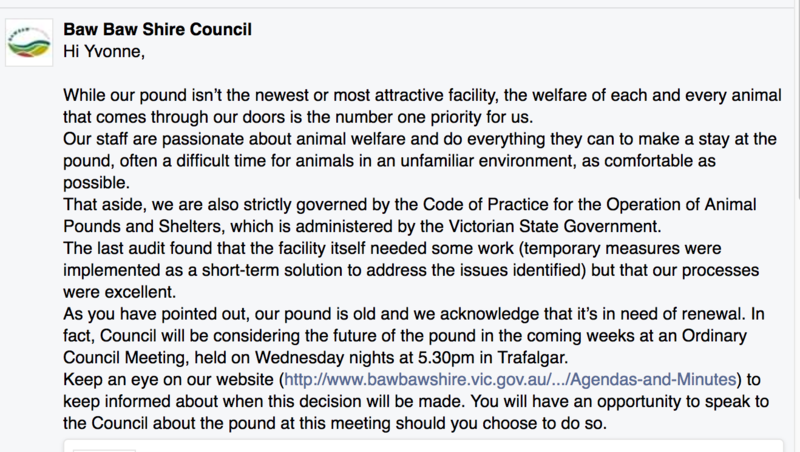 If you're a resident of Baw Baw council, or a concern animal lover in VIC, then please start asking the Mayor what the hold up is. This could and should be rectified by the weekend. *Showing conclusively that one of the greatest motivators to positive change isn't a sudden, overwhelming gush of compassion from local council - or even the community being nicer, getting along or celebrating whatever small mercies are shown to pets - but some hard data being required so the community can push back against what is often the near universal slaughter of pet dogs and cats.